The impressive architecture of the UK's theatres is often a legacy of stark class divides. Here, Amber Massie-Blomfield writes on the buildings that really are for everyone. The first time my mum took me to the theatre was in 1992, to the annual pantomime at the Theatre Royal Bath. As the ugly sisters had an epic custard pie battle up on stage, I sat in the darkness of that perfect Georgian chocolate box, and absorbed it all: the red velvet curtains, the plush tip-up seating, and that special smell of dust that has stayed too long in the dark. It was the beginning of a lifelong fascination with theatres. The Theatre Royal Bath became a kind of second home, and as a member of the resident youth theatre I spent all my free time there. When the company took over the old cinema adjacent to the main house with the intention of transforming it into a purpose-built young people’s venue, my peers and I were deeply involved in the architectural consultation on what would ultimately become the Egg. Perhaps little surprise, then, that I later ended up running a venue of my own, as executive director of Camden People’s Theatre, working alongside artistic director Brian Logan. But my relationship with theatres is not entirely uncomplicated. When, in the summer of 2016, I decided to take my passion to the next level by setting off on an adventure around some of the UK’s most unusual and inspiring venues, and to write a book about it, I was working out some demons too. As John Berger says in The Shape of a Pocket: ‘love is the best guarantee against idealisation’. Having such a profound affection for Britain’s theatres has also given me a keen awareness of the problems they present. At its best, I believe a theatre can be a democratic meeting place where people from all backgrounds come together, to explore what it means to be human, and to share the stories that matter to them. But that only works if, as settings, they are genuinely accessible to all. Herein lies the problem: because for all that the grandeur of the classic auditorium sparks a flame in my heart, for others this is exactly what turns them off. These places seem too exclusive, stuffy, designed to cater to a narrow stratum of society. This isn’t a coincidence – many of these buildings were specifically designed to strike people this way. Marvin Carlson notes in his book, Places of Performance, that ‘audience spaces have almost always reflected with accuracy the class preoccupations of their society’. During my trip I visited the Grand Opera House in Belfast, one of the great playhouses created by Frank Matcham, the most prolific theatre architect of all time. It’s an extravagantly fabulous setting – imagine onion-domed minarets; gold monkeys, elephants and cherabim – but one that was, like so many theatres of the era, specifically designed to keep classes apart. Separate entrances to the various tiers of seating ensured the more affluent could attend without ever having to trouble themselves about an encounter with the lower orders. (Entrance now is communal, via a recently built atrium). How could I celebrate places like this, founded on an ethic so at odds with what I wish theatre to stand for? The issue isn’t purely an anachronism. Theatre still fails to serve the majority of those that pay for it through their taxes: as the 2015 Warwick Commission found, ‘publicly funded arts are predominantly accessed by an unnecessarily narrow social, economic, ethnic and educated demographic not fully representative of the UK’s population’. While this can’t entirely be blamed on the architecture, the simple fact is that if potential audiences don’t feel welcomed ‘across the threshold’, they’ll never experience the art on the other side. So my mission became to seek out examples of theatres that are getting it right – and by so doing, to uncover all that theatres have the potential to be. It took me to some surprising places, and notably many of the locations I ended up visiting were never really intended to be theatres at all. 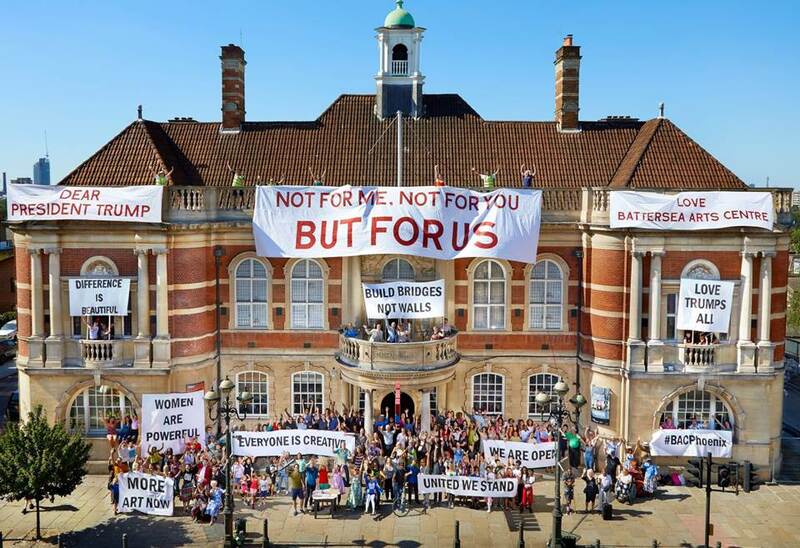 Take, for example, Battersea Arts Centre. Situated in Battersea’s Old Town Hall, built in 1893, the building has been part of the fabric of the local community for much longer than it was ever a theatre – a place where Britain’s first black mayor was elected in 1913 and where the suffragette movement once gathered, where people have witnessed their family members getting married, or attended Slimming World meetings. When the Grand Hall burnt down in 2015, the strength of affection felt by local people for the venue was palpable. This outpouring of emotion and the building’s heritage are surely no coincidence. Another favourite of mine was the Theatre of Small Convenience, a wonderful, 12-seater venue in a former Victorian gentlemen’s toilet in Greater Malvern. It was created by Dennis Neale, a former factory worker and woodland surveillance officer with absolutely no previous experience of making performance; somehow, it was the very unlikeliness of his diminutive playhouse that made his later-life entry into the world of the impresario possible. In his tiny magic-box space, crafted from bric-a-brac picked up at car boot sales and pulled from skips, audiences watch intricate, absurdist puppet shows for just £3. The unlikely setting acts as a spider’s web, drawing in bemused and delighted passersby, many of whom would never part with £25 to see the latest production of Bernard Shaw at Malvern Theatres up the road. I stretched the limits of what constitutes a venue by visiting a theatre without a single window or door to its name. When the National Theatre of Wales was founded in 2009, the decision was taken to eschew centralisation and instead for the company to be itinerant, roaming the nation and staging productions in settings as varied as working men’s clubs, an old army base, a mountainside. In these contexts they have mounted productions of extraordinary scale and ambition with community at their very heart – from a three-day long production of The Passion that took over industrial town Port Talbot, incorporating an estimated 1000 locals into the show’s creation, to an opera in an abandoned library. The kind of productions I suspect the National Theatre, weighed down by Denys Lasdun’s concrete monolith, could never create. Where did all this leave this passionate theatre enthusiast? It would have been possible to come away feeling jaded; to believe that – if a town hall or a public toilet or a country can not only become a playhouse, but can, in many ways, be a more effective means of reaching a whole community – we have no need of buildings designated for the purpose at all. And yet, I found reasons to feel hopeful about the role theatre buildings have played, and continued to play, in our society. The new Liverpool Everyman is the perfect antidote to any cynicism about the value of purpose-built theatres. Created by Haworth Tompkins, the coolest theatre architects in the country right now – responsible for The Bridge and recent redevelopments at the National Theatre and the Bristol Old Vic – the construction on Liverpool’s Hope Street is the first theatre ever to win architecture’s most coveted laurel, the Stirling prize. It isn’t hard to see why. In every detail – from the glass-fronted rehearsal rooms, to the way in which the atrium’s floor continues as a flat plane of concrete directly from the pavement, this is a building designed to feel open, porous to the life of the street outside. Ordinary materials like concrete, old school desks and reinforced glass are transformed into objects that are beautiful and worthy of consideration: which is, in fact, a perfect expression of the ethos of theatre itself. In the auditorium, I watched the matinee show with 399 school kids who whooped and cheered throughout and seemed to be having the time of their lives. When they left at the end, the seats retained the imprint of where their bums had been, because the pile of the fabric has deliberately been laid upside down to collect the patterns of wear: a celebration of the presence, of the audiences that have been here. And I suppose, ultimately, that’s the point: it’s people that make theatres, not bricks and mortar. But there’s something to be said, too, for the way a theatre building typically transcends the span of a human life, and so it can come to belong to a place – a community – rather than any individual. A part of the terrain of a place, communicating in the vernacular, that might be seen to stand in some ways for what that community values. One rainy night last summer, I went to an amateur dramatics performance of A Midsummer Night’s Dream on the ruins of the Roman theatre of Verulamium in St Albans: the oldest site of a theatre now accessible anywhere in the UK, built in around 140AD. It was fun and eccentric and I think I was the only person in the audience who didn’t know a single member of the cast. At the end, soaked to the skin, we leapt to our feet to join in with the cast’s rendition of Stevie Wonder’s Superstition, and I marvelled at how little, really, has changed. I thought of all that collection of stones has born witness to, and in that moment it seemed to me extraordinary that, in spite of all that the millennia have thrown at us, we keep coming back to be together, here, in places like this. And that seems like something to celebrate. ‘Twenty Theatres To See Before You Die’ is published by Penned in the Margins, and available at bookshops nationwide. More info here.